LeRoy Mitchell, 92, made the final table on March 21, 2018 at Research Medical Center in Kansas City Missouri. Celebration of his life will be on Tuesday, March 27th at 7:00 pm, St. Paul’s Methodist Church in Raymore Missouri. Officiated by the Reverend Pastor Monty Stratton. No flowers please, donations in his name, to the Veterans Administration or American Heart Association, would be a great way to honor him. LeRoy was born November 8, 1926 in Kansas City Missouri. At age 18, he enlisted in the Coast Guard and served in World War II on the USS Knoxville Frigate #64 in the Atlantic. He was very proud of his service and told many stories. He graduated from Missouri Valley College in Marshall Missouri in 1950 with his Masters in Education. He met and married his lifelong love Sarah Spainhour-Dringman in 1951. Leroy had a distinguished career in teaching and coaching for 57 years in the state of California and in the Hickman Mills and Ruskin school districts in Kansas City. He retired from teaching in 2007. Pops loved to play poker and enjoyed his poker league and many wonderful friends he played with. He loved to travel and collect rocks. He was an avid gardener too. He was a brilliant man who loved math and science. He was a master of the Fibonacci Code and the golden spiral. He loved to do crossword puzzle‘s with his buddies at McDonald’s. Leroy loved to read and spend time with his “library ladies”. 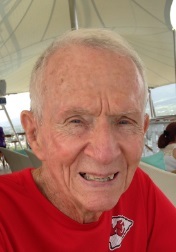 Poppy was an avid Chiefs and Royals fan and loved to watch tennis and his boy Rafa Nadal. LeRoy was quite the outdoorsman, he loved to fish and hunt. He also loved to coach, referee, and ump any sport. He also enjoyed “working out” with his buddies at the Belton wellness center. Leroy was preceded in death by his beloved wife Sarah Mitchell. Leroy had no children and is survived by a very loving, blended and adopted family. Kenneth Mitchell, Shana Mitchell, Kody Mitchell, Paul Dringman and Myrna Lowe, as well as step grandchildren and step great grandchildren and many other beloved family and friends. Leroy was a wonderful husband, stepfather, grandfather, coach, and a loyal friend to many. Poppy was a good man and will be missed terribly.